Seafood. I guess as today is prawn toastie day we can call it a nautical theme somehow, parcelled up with yesterday’s Anchovy offering. Still, prawns are tasty and delicious, while in my unbiased opinion anchovies are salty little blights on an otherwise perfectly good dish. 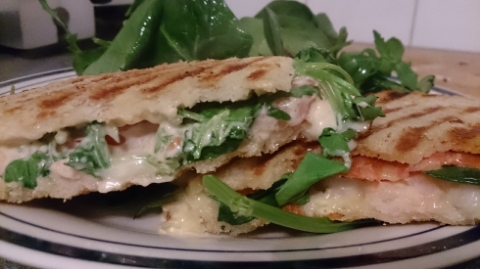 We already have a rather lovely crayfish toastie (mozzarella, houmous, sun dried tomatoes, pesto and crayfish) but we wanted to experiment with a more mainstream combo, and see if classic 80s dinner party favourite Prawn Cocktail works in a toastie. 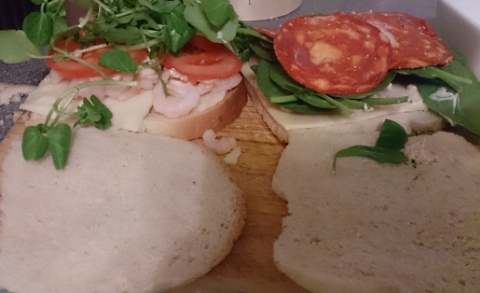 Starting with cooked prawns (which we did) makes this a technically simple toastie. Just don’t over do the thousand island and keep prawns and dressing in the middle. Easy. I went into this feeling like I might be starting the new year with 2 mediocre toastie posts in a row. Instead I’m seriously considering bumping the signature score a little. The Prawn Cocktail V2, which really isn’t a prawn cocktail at all any more, will almost certainly be making an appearance some time soon, and we are on for a month of toasties.